Easter Discount Hunt is on. 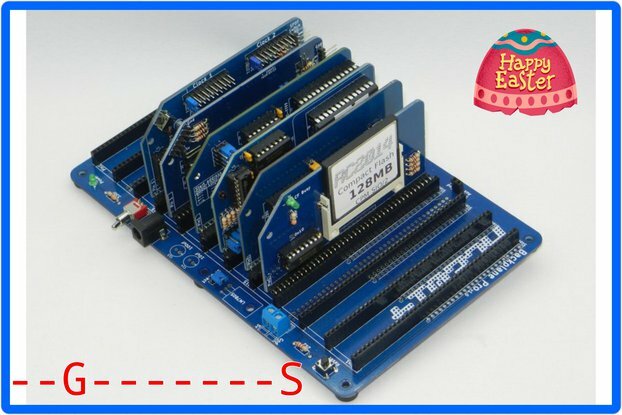 Take a look at [RC2014 Pro](https://www.tindie.com/products/Semachthemonkey/rc2014-pro-homebrew-z80-computer-kit/) for your first clue! RC2014 is a simple 8 bit Z80 based modular computer. It is inspired by the home built computers of the late 70s and computer revolution of the early 80s. It is not a clone of anything specific, but there are suggestions of the ZX81, UK101, S100, Superboard II and Apple I in here. It nominally has 8K ROM, 32K RAM, runs at 7.3728MHz and communicates over serial at 115,200 baud. As a bare minimum, you will need a CPU, ROM, RAM, Clock and Input/Output module. The RC2014 is designed in such a way that you can build your own modules to expand it. As such, if you have access to similar components, or have specific needs, you might not need all the items I have on offer. This module is a combined 512k RAM and 512k ROM module that has been designed to run RomWBW operating system on the RC2014 with a Z80 CPU. Due to the 64k of addressable memory limitation of the Z80, the memory in this module is divided up in to multiple 32k pages. It is designed to replace both the ROM and RAM modules in the RC2014 Classic, RC2014 Plus or RC2014 Pro, and can also be used with the RC2014 Mini if the ROM and RAM chips are removed. RomWBW is a ROM-based implementation of CP/M-80 2.2 and Z-System for all RetroBrew Computers Z80/Z180 hardware platforms including SBC 1/2, Zeta 1/2, N8, Mark IV, and RC2014. Virtually all RetroBrew hardware is supported including floppy, hard disk (IDE, CF Card, SD Card), Video, and keyboard. VT-100 terminal emulation is built-in. The RomWBW ROM loads and runs the built-in operating systems directly from the ROM and includes a selection of standard/useful applications accessed via a ROM disk drive. A RAM disk drive is also provided to allow temporary file storage. As the author of RomWBW, Wayne Warthen has ported this operating system to the RC2014, and it will auto-detect either the 68B50 ACIA or the SIO/2 UART, and will, if available, use the Compact Flash Module for storage. It can also support Ed Brindleys IDE Module and RTC Module, as well as Dr Scott Bakers WDC and FDC Floppy Disk Modules with a recompiled base image. Standard Kit This includes all the components to build the 512k ROM 512k RAM Module, including PCB, RAM, pre-programmed ROM, Support chips and passive components. Everything as expected and shipped as quick as should be. Quality is OK. Very good kit and easy to put together. The 512k ROM 512k RAM RomWBW Module for RC2014 is a very good kit, well thought out and easy to put together. This is one of my favorite rc2014 modules (very well done Spencer). It replaces any RAM and ROM modules. It will be a central part of any rc2014 rig. The software part is maintained by Wayne Warthen. It is relatively expensive but according to Spencer Owens its due to the component price. You can buy empty boards and source the components cheaper, but for most people buying the complete kit is a good value considering the time and effort gathering all components. The quality of the PCB is amazing and it is very easy to solder. It is always fun to build such a nice part. I have procured a single board Z80 computer kit together with this 512k ROM 512k RAM RomWBW module. The kit is great, this supplementary module fits and functions perfectly, is easy to assemble, and arrived in a very sturdy package. The documentation is more than clear enough to permit fluent integration of the base kit and this memory module. If you are interested in a Z80 kit with more memory and more programs included, I advise this supplementary module and this company very much. Professionalism as it ought to be everywhere! This excellent Module for the RC2014 with RomWBW allows the easy use of several 3rd Party cards, such as Ed Brindley's Sound Card and IDE Card. I cannot recommend this Module enough! While the original RC2014 (Pro) Kit is a wonderfully complete and highly capable system, this Module opens up more possibilities and opportunities for fun, learning, exploration, and expansion. I would strongly suggest that a ZIF-style socket is installed for the ROM socket (Location U1) as you will find yourself putting a new version on that ROM frequently. It may be a tight fit, and the solution I found was to install the regular socket as instructed, then use some "Swiss Pin" type headers between the socket and the ZIF socket as a "stand off" to increase the clearance. I bought this module to give me more choice of CP/M builds on RC2014, allowing use of RomWBW which apart from providing ROM & RAM disk, has support for various disk and CF card add-ons and gives a choice of CP/M 2.2 and Z-System (ZSDOS 1.1). The usenet group RC2014 is very supportive to newbies with build and debugging advice (not that that is always required). Spencer Owen (RC2014) and Wayne Warthen (RomWBW) are very supportive of their user-base. I am not an expert, yet managed to build and run without problems, with each card my soldering gets better.